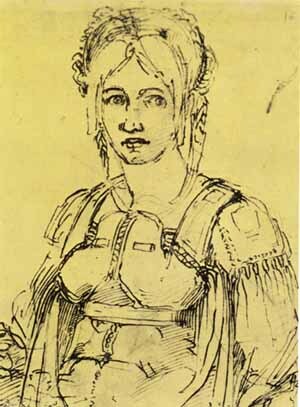 In any event, Victoria (in English) Colonna was born in 1492 and died in 1547. In the meantime, she made the friendship of Michelangelo, Ariosto, Sannazzaro, Aretino, and others, composing along the way a body of poetry that would one day have her hailed as the "first great woman poet in the Italian language." Also along the way, she married Ferrante Francesco d'Avalos (painting, right) in 1509, Marquis of Pescara, a Neapolitan nobleman of Spanish origin, who was one of the chief generals of Emperor Charles V. Vittoria and Ferrante were married in the fine Aragonese castle on the island of Ischia in the Bay of Naples and lived there for a number of years. Ferrante was one of Charles V's generals at the great battle of Pavia in 1525, the climax of decades of war between France and the Holy Roman Empire for control of the Italian peninsula. The battle proved to be the last stand for knights in shining armor, as the French knights were annihilated by the new harquebus design of hand-held firearm used by Imperial forces. During the battle 3000 harquebusiers killed over 8000 French armored cavalrymen. Ferrante was then involved in an anti-imperial conspiracy that might have wrested the Spanish vicerealm of Naples away from Spain and put himself on the throne of Naples with Vittoria as his queen. We'll never know, since (1) he died from the wounds incurred at Pavia, and (2) he is said to have given up the idea because his Vittoria told him that she would rather be the wife of an upright general than the consort of a king who had backstabbed his way to the throne. volge dall'altre strade a questa il volo. "I live upon this fearful, lonely rock, like a sorrowing bird that shuns green branch and clear water; and I take myself away from those I love in this world and from my very self, so that my thoughts may go speedily to him, the sun I adore and worship. And although they do not try their wings as much as I wish, yet when I call them back, they turn their flight from other paths to this one." The same people (the New Advent Catholic Encyclopedia) that called her "Vittori-O" says that she was "undoubtedly greater as a personality than as a poet." I disagree. They can't even get her name right. Quite recently, an unknown booklet of lyric poetry by Vittoria was found at the Vatican. The booklet includes 109 compositions. The discovery was made by researcher Fabio Carboni, who describes the finding in an essay published in Aevum, the review of the historical, linguistic and philological sciences of the Humanities Department of the Catholic University of Milan.